A remarkable true story of bravery and sanctuary during World War II - for fans of The Guernsey Literary and Potato Peel Pie Society and The Postmistress.Now a major motion picture, starring Jessica Chastain and Daniel Brühl, based on a remarkable true story of bravery and sanctuary during World War II - out in Spring 2017.When Germany invades Poland, Luftwaffe bombers devastate Warsaw and the city's zoo along with it. With most of their animals killed, or stolen away to Berlin, zookeepers Jan and Antonina Zabinski begin smuggling Jews into the empty cages.As the war escalates Jan becomes increasingly involved in the anti-Nazi resistance. Ammunition is buried in the elephant enclosure and explosives stored in the animal hospital. Plans are prepared for what will become the Warsaw uprising. Through the ever-present fear of discovery, Antonina must keep her unusual household afloat, caring for both its human and animal inhabitants - otters, a badger, hyena pups, lynxes - as Europe crumbles around them.Written with the narrative drive and emotional punch of a novel, The Zookeeper's Wife is a remarkable true story. It shows us the human and personal impact of war - of life in the Warsaw Ghetto, of fighting in the anti-Nazi resistance. But more than anything it is a story of decency and sacrifice triumphing over terror and oppression. Jan and Antonina saved over 300 people from the death camps of the Holocaust. It has already been acclaimed by Jonathan Safran Foer: 'I can't imagine a better story or storyteller. 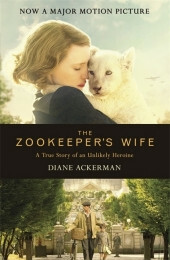 The Zookeeper's Wife will touch every nerve you have.